The Pfeiffer yearbook started in 1938 as the PaJaCa. The name changed in 1955 to the Panther, which was the mascot for Pfeiffer at the time. The name changed again in 1956 to the Chimes because students wanted to change the name of the yearbook to reflect Pfeiffer's new status as a four-year college. A contest was held to decide the name, and The Chimes was the overwhelming winner. A record player based Norton Tower Chimes System was installed in the Chapel spire in 1955. 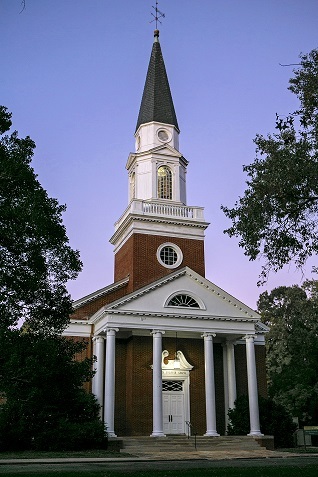 Several large gifts from members of the Board of Trustees ignited a fire on campus to raise the rest of the funds to make possible the installation of the Chimes in the Chapel. Dr. J. Lem Stokes II, the president during this time, suggested that each person on campus should raise $2 towards the approximately $1,800 cost for installation of the Chimes System. The money was raised, the system installed and the Chapel Chimes rang for the first time Sunday, December 11, 1955, at 6:30 p.m.
With a grant provided to the Digital Heritage Center, Pfeiffer University's yearbooks have been digitized and are now available online. © Copyright Pfeiffer University. All Rights Reserved.